I’m as southern as the days are long, but this is a first for me – baking a sweet tea and lemonade cake! I mean, sure, southerners are known for their good food and their sweet tea. But to be totally honest, I haven’t had sweet tea in years – unsweetened for me, thank you very much! 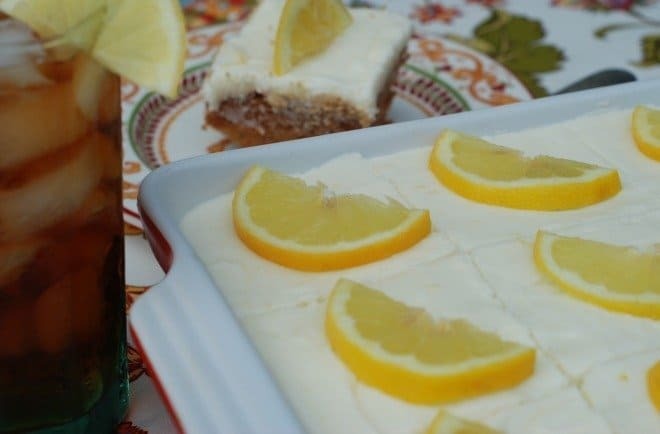 And, yes, I’ve seen tea being used in various recipes for a while now, but I could never really wrap my head around the trend, until I saw the Sweet Tea and Lemonade Cake in the August edition of Southern Living and I knew I had to try it for my hit or miss Wednesday! I can’t help it that most of the recipes I try are hits. I mean, I have a good eye – what can I say! The tea did add a darker color to the cake, but it didn’t taste like I was eating sweet tea! And the cake was moist and delicious. I could just eat the cream cheese/lemon icing with a spoon, but I didn’t. I do know who licked the icing bowl once I was done, but I’ll never tell! It wasn’t me! And, of course, everyone loved the sweet tea and lemonade cake! It’s a great cake for a crowd, a potluck, family dinner or to just impress your friends! You can find the recipe here! Helpful Hint: Next time I bake this cake, I will make it a layer cake instead of a sheet cake – thinner layers, more icing per bite! Have you ever used tea in a recipe? I’ve used tea to tint my hair… does that count? 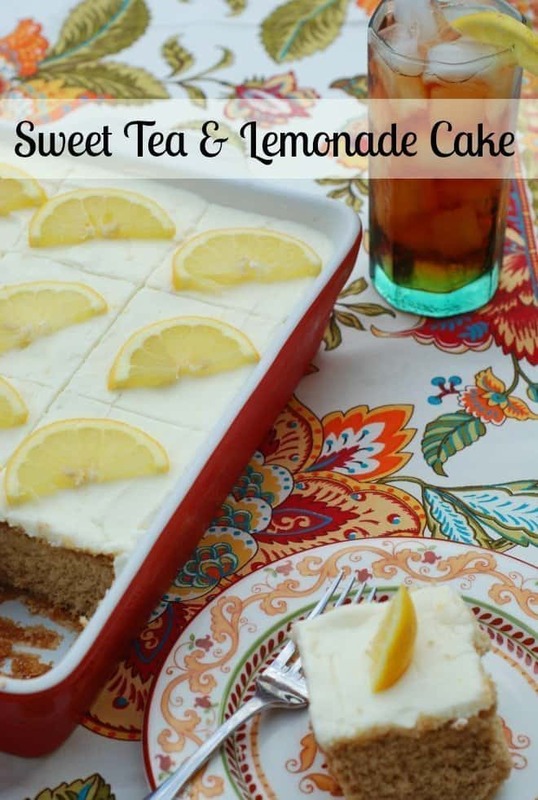 Sweet Tea Lemonade Cake sounds very Paula Dean. I would love to try a bite. It does sound like something Paula Dean would make! I was a little nervous about adding tea to a cake, but everyone loved it. That looks de-lish and all the southern talk makes me miss Louisiana. Yum! It’s a unique combination and it sounds great! I live in the South too, and have never heard of putting sweet tea into a cake! It looks fantastic though, and I can imagine a few people who would go crazy for it. I love the sliced lemons on top ~ so pretty! I’ve never even considered adding tea into any recipe, coffee yes but not tea. My first thought is the addition of caffeine but tea can be purchased decaffeinated now. My husband shares your love for trying out the recipes in the current edition of SL. I’m sure we will be tasting this soon if it strikes his fancy. Yummy!!! And your cake looks so pretty! I’ve pinned. These look amazing! I love my sweet tea. I’m pinning! 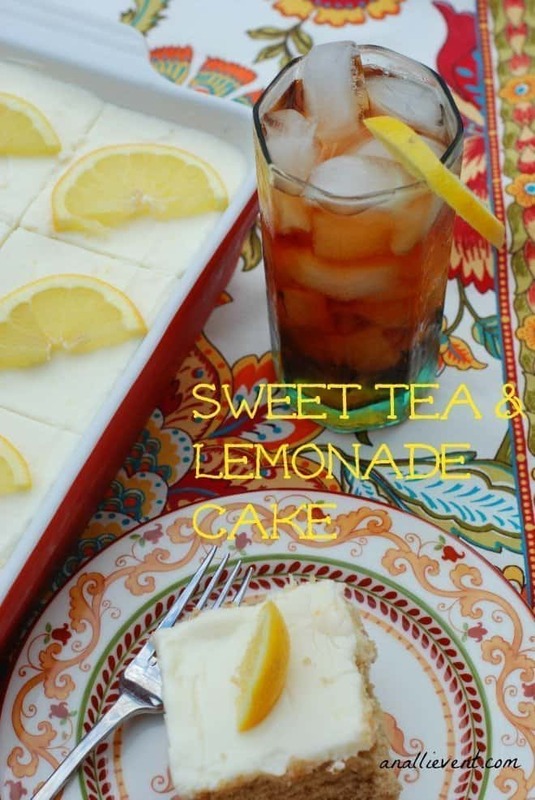 You can’t go wrong with sweet tea and lemon cake (lemonade), so it is a hit for me! I’m not a tea fan at all. I know, I know! It’s just nothing I ever liked, but you have me curious about this cake!! I’m a big fan of icing, so I have a feeling I’d love this cake, lol! You always post the best recipes!! Christine recently posted…July Beauty Empties!! I’m southern, but I have never heard of putting sweet tea into a cake. It looks delicious though. I’m sure my sweet tea loving family would love this recipe! Thanks so much!! This looks like a wonderful combination of summer flavors. I am sure your daughters enjoyed this delicious dessert too. It looks perfect for summer! And no, I’ve never used tea in a recipe – interesting! Kristen from The Road to Domestication recently posted…A Patio Reveal! I’ve never baked with tea, but I’ve always wanted to make Earl Grey macarons! That sounds awesome! Love Macarons! This cake looks super delicious! I love sweet tea, but I never used it in a cake recipe. I love baking cakes that add a little something extra than just cake and icing. This cake looks like a delicious recipe to try! AHHH I’m with your daughters – stop posting delish things until I’m off the diet! haha. This looks divine. I mean, what could be better in the South then SWEET TEA and LEMONADE cake!? I think nothing.